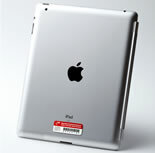 iPad/Tablet Security - Protect your iPads/Tablets from theft! Protecting your iPad or Tablet is challenging. The best part of them is their small size and light weight, but this also makes them an easy target for thieves. If you are concerned about theft, we have a couple of solutions for you. Simply glue on a thin adapter to your tablet case and then snap the lock on or off to easily secure or pack up your tablet. A STOP Security Plate is the most cost-effective prevention, anti-theft, recovery, and asset management tag available.